Every day we are faced with decisions. Some are small and unimportant, some are big and very important. Choosing a metal stamping vendor is one of the big decisions businesses are faced with and on that should be researched and considered carefully before making a final decision. As a vendor, we know how difficult it can be to find a company that is a perfect fit and meets all your needs. With so many companies in the industrial marketplace, what is the best way to feel confident in your selection? As with all major decisions, doing research into potential vendors is key. Choosing a vendor goes beyond just what capabilities they have. The company’s background and a deeper look into company policies, qualifications, and certifications brings a potential vendor’s company focus into view. Not many companies will offer an in-depth view into every aspect of their process. At HPL Stampings, we are proud of the quality and consistency of our process and products. We are extremely happy to explain exactly how we work and think. It takes time to go through our complete set of skills so we have made it easy for potential customers to get to know all about us. 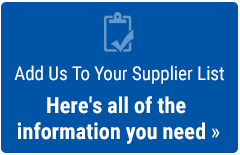 Our new guide, HPL Stampings, Inc. Company Overview, provides an in-depth look at everything we have to offer and all of the information you may need to put us on your Approved Vendors List. Download this free guide today to learn why we are the industry leader in custom short-run metal stampings, and why we should be on your Approved Supplier List.